206 pages | 1 B/W Illus. China’s future development is likely to have a huge impact on twenty-first century global outcomes. It is therefore surprising that, thus far, so little attention has been given to comparing and evaluating expert forecasts of China’s future in the post-Mao era. This book presents an illuminating and comprehensive summary record of contrasting and competing expert forecasts and judgements about the major issues confronting China within four principal domains – political, economic, environmental, and international. After considering the principal forecasting methods available to experts, the author comments critically on the degree of success achieved in using those methods and emphasises the confusion created by the polarisation of opinion and by the failure of many experts to accept the high degree of uncertainty that characterises most of the key issues. The book recommends a new approach based on the study of a hierarchy of critical uncertainties and on continuing analysis of opposing expert opinions about these uncertainties. It emphasises the potential for both positive and negative outcomes for these critical uncertainties, and the importance of maximising the potential for positive outcomes through improved analytical and policy frameworks. Providing insights for specialists and non-specialists into the most critical issues that will determine China’s future direction, this book will be of particular interest to students and scholars of political, economic, environmental, and international relations issues in China and Asia, as well as to readers in business and government. "It is fascinating to review the diverse forecasts that experts have made in recent years about China’s politics, economy, environment, and international relations. How is it possible that they disagree so much? Irvine wisely counsels caution, insisting that we must allow critical uncertainties to temper our ambition to know the future." "In all the discussion over the implications of China’s rise, one of the knottiest questions is just what sort of a China is it going to be. 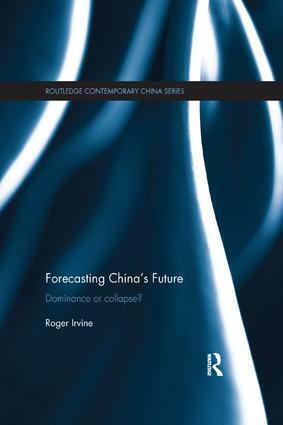 Roger Irvine offers a unique and path-breaking contribution to the task of forecasting China’s role, with special attention paid to the relationship between China experts and the uncertainty that is intrinsic to this challenging but necessary enterprise. His balancing of theory with practical case studies of prediction across a variety of fields is exemplary, and his conclusions are judicious and well supported by the evidence he presents." "Roger Irvine brings to this much needed overview of contemplating China’s future…by (mostly) western based experts…a former government analyst’s clarity and fair mindedness…In his concluding chapter, Irvine makes two valid points. The first is that, based on the evidence very expertly and concisely summarised in this overview, there is an urgent need for better predictive models. His second is that in predicting the future, we are, to some extent, trying to make what we say happen. We should be grateful for Irvine’s book gently, but forcefully, making these failures so evident, and allowing for at least some attempt to rectify them." Roger Irvine is a Visiting Research Fellow at the University of Adelaide, South Australia. He was a visiting scholar at Tsinghua University, China during 2010 and at National Chengchi University, Taiwan during 2014.